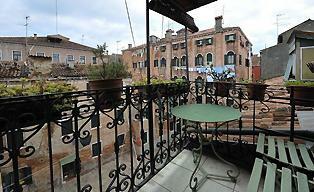 Book an apartment with terrace Venice Italy. Experience the comfort and safety of a spacious furnished apartment. Why stay in a hotel room if you can share an apartment with family or friends? Venice will hit you, or not. Simple, but many have already fallen in love with this magnificent Italian city. Three bedrooms and two bathrooms up to 5 people. 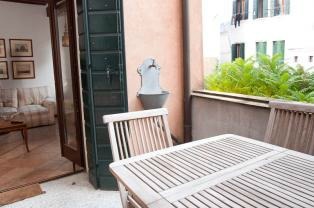 This beautiful Venice accommodation is located opposite the Piazza San Marco and offers fantastic views of the of the basilica from the terrace. Prices range between EUR 327,00 up to EUR 363,00 a night. Very expensive, but luxury and at a great location. Minimum stay is three nights. 1 bedroom and 2 bathrooms up to 2 people. My favorite Venice district. 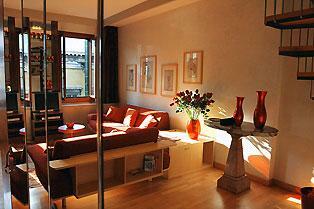 Dorsoduro is close to the San Marco and the Peggy Guggenheim Museum in a calm tourism area. This Venice apartment is clean and bright. The location is perfect. The lounge opens on to a terrace ideal for relaxation and has a double sofa bed. Ceilings retain the traditional wooden beams. A beautiful stone fireplace can warm the coldest and romantic Venetian nights! Two bedrooms and two bathrooms up to 5 people. Out of the crowded Venice tourism in a nice quiet place in the area of Cannaregio. Very close to a vaporetto stop. Walking to the San Marco is around 30 minutes. But, hey, this is a holiday, and during walking, you will see Venice how it is. The beautiful apartment patio terrace makes it complete. Prices range between EUR 201,00 up to EUR 298,00 a night. A middle range for a quality apartment in Venice. Minimum stay is three nights. A lovely cozy duplex with modern style and furniture. Cannaregio is the northernmost of the six historic districts of Venice. You have read about apartments with terrace in Venice Italy. There is enough to explore, as you can see. Please click on the links to explore my site more.